My heart aches for the families in Oklahoma. These storms are hitting too close to home for me. I live in tornado alley myself and so far, have been extremely lucky and blessed to not get hit by one. They are all around me and needless to say, it is very scary. So to keep my mind off the storms, I was able to get in my craft room more this week and get some projects completed. Today's card is a card I did over this past weekend. This is my next personal challenge with my good friend Kellie at A Little Bit of Kellie. 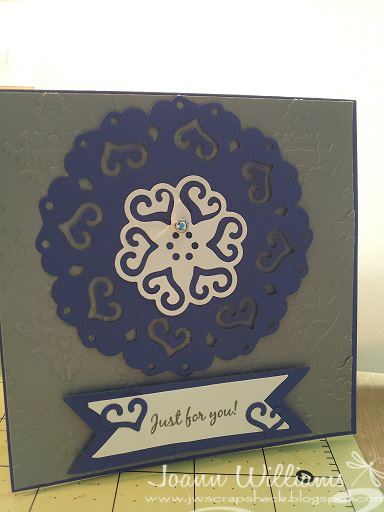 The challenge was to use blue and gray with some embossing. My card is sized at 5 X 5. I used bazzill cardstock for the base of my card and I used the new Silky Smooth Neutrals cardstock by DCVW as my front layer(gray). Love this paper! I ran it through my ebosser using my damask embossing folder. This paper has now become my favorite paper to emboss with! It embosses so smoothly and it raises up beautifully! I used my Spellbinder's Contemporary hearts pendants shapabilities dies as my main focal point. I added a small light blue brad to the center top of the die cut shape because I felt like it needed something. Lately I have been using a lot of bling and sequins so it looked too plain with nothing. 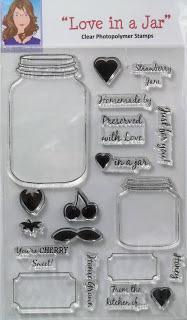 My sentiment, "Just for You" is from the new "Love in a jar" stamp set by Cardz TV. Very cute stamp set! I stamped the sentiment onto Bazzill white cardstock using my momento tuxedo black ink and cut it into a banner shape and then matted that onto some more of the blue cardstock, also into a banner shape. 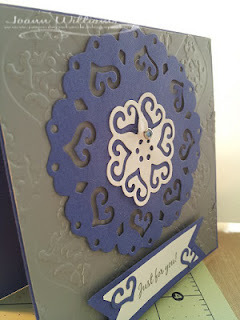 I then took some of the negative heart pieces from the main die cut and used them on my sentiment banner. I thought they looked cute and it gives the sentiment a framed look. she created for this challenge. LOVE the Simplicity and Beauty of this card!! !Love it! Beautiful card, Jo!! I love embossing and this is gorgeous!! Very pretty die cut! What a cute card. Such pretty coloers. TFS.